Weatherproof formula binds to the hair shaft to repel and protect from insects through sweat, rain, dust and dirt for up to 14 days. Kills & repels ticks, including deer ticks that may transmit Lyme Disease. Kills & repels mosquitoes that may transmit West Nile Virus. Water based. 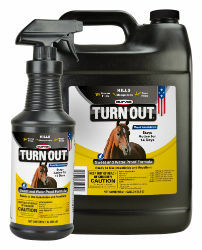 For use on Horses, ponies, foals, dogs, puppies and as a premise spray. USE AS A WIPE ON: First brush animal to remove excess dirt and dust. Moisten (but do not wet to the point of dripping) a soft cloth and rub over the hair. It is best to apply by rubbing against the hair growth. Apply to common areas where flies will gather: legs, shoulders, flanks, neck and facial areas. Only a light application is required. After application, brush out thoroughly to bring out a bright sheen on the coat. Repeat daily as needed. USE AS A SPRAY: May be applied as a fine mist spray to the flanks, face, legs, topline and other areas where flies congregate. Do not wet horses skin or exceed two ounces per application. After application, brush out thoroughly to bring out a bright sheen on the coat. Repeat daily as needed.